Which Investing Style Is Right for You? 8 Investing Styles: Which One Is Right for You? If you are ready to take the important plunge into investing your money, it’s important to remember that there is not a “one-size-fits-all" approach. You will want to take some time to ask yourself a few very important questions before deciding on an approach that will work best for you and your investing goals. For example, are you a risk taker or are you risk averse? Are you looking for long term growth or immediate gains? Are you planning to be a do-it-yourself investor or are you planning to hire an investment advisor? Once you’ve answered a few key questions and put together your own investor profile, you will be able to match your needs to a specific investing style. Do you have a high tolerance for risk? Are you looking to be an active participant in the market multiple times a day? If so, an active investing style might be right for you. Active investing is generally used by investors who aren’t as concerned with the long-term horizon as they are with the present. Active investors select specific stocks and use market timing to try to outperform the market in an effort to seek short-term profits. Active investing requires an investor to be on constant watch over the market and his/her positions in the market. If you are more risk-averse and don’t want to stare at the market screens on your computer all day, a passive investing style may be more up your alley. Passive investors are those who invest their money with a long-term time horizon. Instead of trying to time the market like an active investor, passive investors create portfolios that track a market-weighted index or portfolio. Tracking an index will generally result in reduced risk due to diversification as well as lower transaction costs due to low turnover. 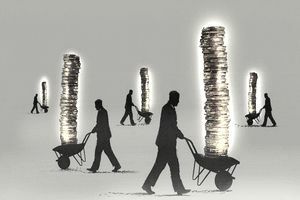 The growth style of investing is one that focuses on stocks of companies whose earnings are growing faster than most other stocks and are expected to continue to grow. These stocks are oftentimes referred to as being overvalued and have a high price to earnings ratio. It is important to note that these stocks generally pay either a low or no dividend. Unlike growth investors who seek out overvalued securities, value investors look for those stocks that are out-of-favor or undervalued. Value investors expect that these securities will rise and seek to buy them before they do. Those investors who select stocks based on the size of the company are using a market capitalization investing style. Market capitalization, or market cap, is computed as the number of shares outstanding multiplied by earnings per share. Small cap companies have a market capitalization of $300 million to $2 billion, mid-cap companies have a market capitalization of $2 billion to $10 billion, and large-cap companies have a market capitalization of over $10 billion. Small-cap stocks are generally riskier investments than large-cap stocks. While their returns may be higher, their volatility is also higher. On the other hand, large-cap companies are those that have been around a much longer time and tend to be more stable. Many people use large-cap stocks in their portfolio because of the dividends and stability. A buy and hold investing style falls under the umbrella of passive investing. An investor who is engaged in buy and hold investing rarely trades in their portfolio and is mostly concerned with long-term growth. Another popular form of passive investing is indexing. With this style of investing, an investor creates a portfolio that mirrors the companies of a particular stock index. The portfolio generally will perform in-line with the index. This kind of investing is good for people that are more risk-averse because of the diversification of the index. The costs, including transaction costs and taxes, related to managing these kinds of the portfolio are relatively low in large part due to less turnover. There are two kinds of risk that every investor must be concerned about: systematic risk and unsystematic risk. Systematic risk is a market risk that cannot be diversified away. But unsystematic risk, or the risk that comes from investing in one particular company or sector, can be diversified away. For example, if you were to invest only in technology companies, you would have a high level of risk due to owning stocks in only one sector. By diversifying your portfolio and adding in or replacing some of the technology companies with consumer goods companies, your risk level would be reduced.